Resistant fracture fills have also been imaged at a smaller scale by the Mars Exploration Rovers (Image 2). In the sedimentary rocks of Meridiani Planum, these millimeter-to-centimeter-wide fins contain clastic grains and only partially fill fractures, consistent with minor cementation by Fe-oxides or silica deposited along fracture walls (Knoll et al., 2008). 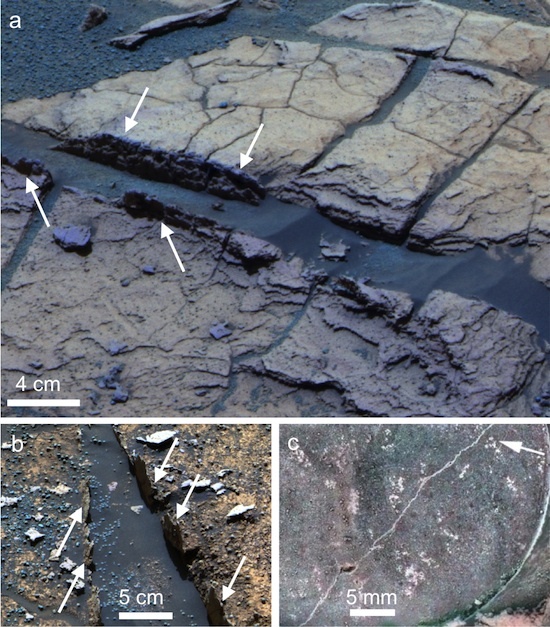 Even narrower salt veins are found in Martian meteorites (Bridges et al., 2001) and were observed by Spirit in some basaltic rocks in Gusev crater. 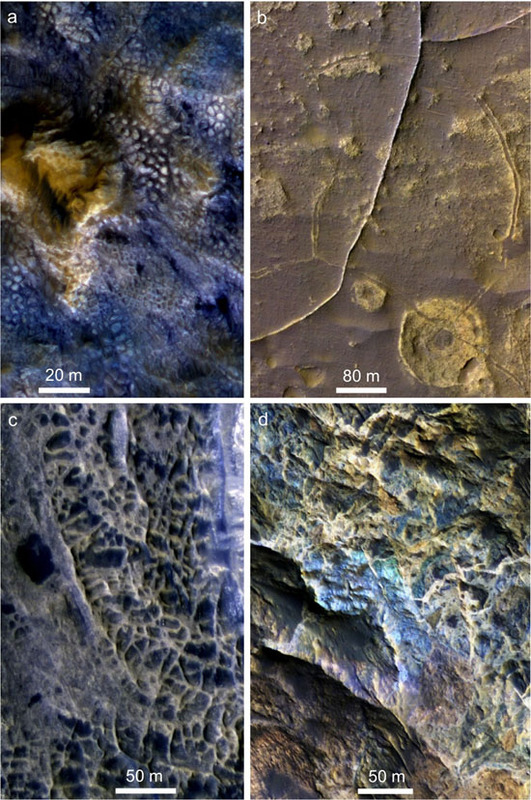 Fracture paleo-fluids on Mars manifest their influence over a range of scales. Image 2: (a) Fins protrude from fracture walls at Erebus crater outcrop, Meridiani Planum. Opportunity Sol 725 Pancam L257 image; credit D. Savransky and J. Bell (Cornell) / JPL / NASA. (b) Similar fins at Endurance crater outcrop; Opportunity Sol 170 Pancam L257. (c) Light-toned vein in rock Mazatzal, Gusev crater; Spirit Microscopic Imager mosaic colorized with Pancam, modified from Haskin et al. (2005). Mars rovers may soon sample some of the larger ridged fracture features visible from orbit. Opportunity is driving toward the rim of Endeavour crater, the nearest portion of which (“Cape York”) has a polygonal texture in places, with light-toned ridges along polygon boundaries that may be resistant fracture fill (Wray et al., 2009). Furthermore, next year the Mars Science Laboratory rover Curiosity will land at one of four candidate sites, each of which has fractures with positive relief in places (Image 3). 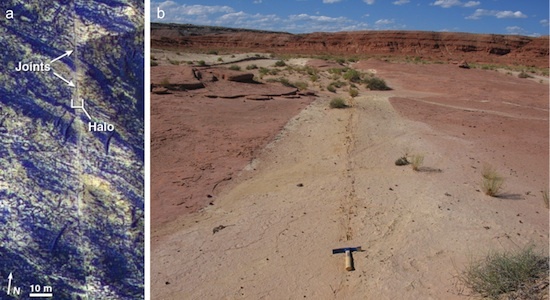 In some cases these ridges could have formed through “dry” processes such as dike intrusion or contraction, the latter especially where ridges are paired (Hallet et al., 2011). But in other cases, fracture ridges with distinctive colors likely mark fluid migration pathways, and rover observations of their compositions will enable characterization of subsurface aqueous environments distinct from those recorded by the fluvial landforms at the ancient surface. The final landing site selection workshop for Curiosity occurs this month.